I hear a lot of people say that they would never separate from their pet in the case of a natural disaster emergency. I feel the same way. However, I have worked in emergency management before. I know the truth is you can’t always choose to stay. Also, it’s quite possible you could be away from home when disaster strikes. In that case, there is a very good chance you won’t be allowed back into your neighborhood or into your house to get your pet. How do you prepare for that situation? It doesn’t always have to be a natural disaster that keeps you away from home and your beloved pet. If you are in a car accident, you most likely will be taken straight to the hospital. You may have a significant other or roommate but what if they are in the car with you? What if they are out of state? Or not able to leave work for fear of being fired? I’m not trying to scare you. However, these ARE realistic situations even if you want to think it won’t happen to you and your pet. The good news is, there are some things you can do. Personally, there are several ways I try to make sure Chester and Gretel stay safe if an emergency occurs and I can’t get home. To protect them in case of natural disaster, I…. 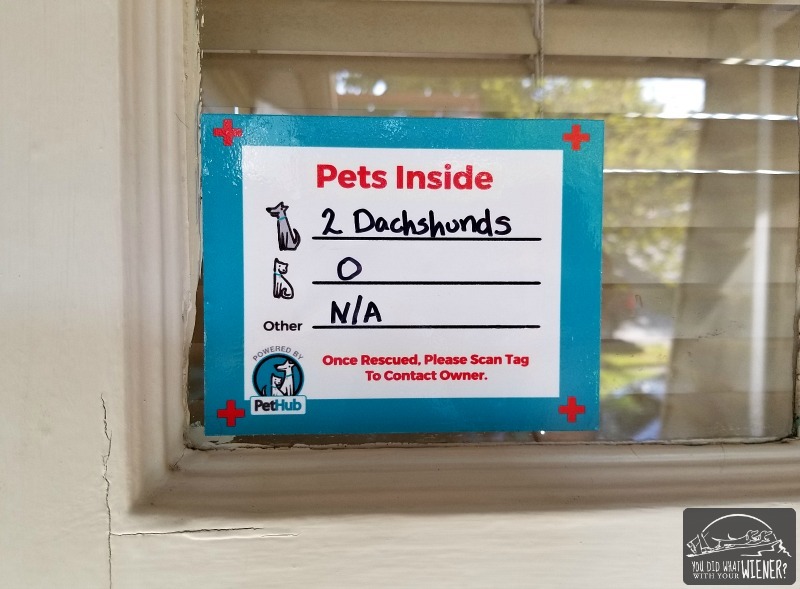 Put a decal on the front and back door so first responders know to expect two dogs inside. Place Chester and Gretel in a dog crate when I am away – That way they are safely contained so they can’t run away if the disaster damages part of the house and provides a way for them to get out. Also, if they need to be moved by rescuers, the stress is reduced because people won’t have to chase and trap them first. Put their ID tags on them before putting them in the crate (I should actually have them wear them at all times around the house but admit that I don’t). Place a tag on their crate that clearly identifies them and gives disaster responders and animal rescuers way to contact me. 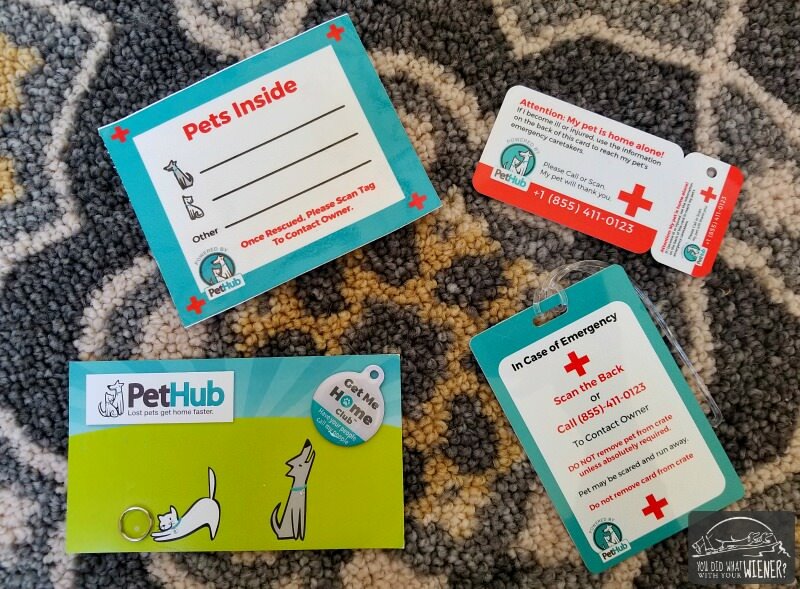 Carry a card in my wallet, and on my keychain, that alerts emergency personnel that I have pets at home that need care. Provide contact information for neighbors and/or friends that live nearby who can take care of my pet’s immediate needs until a longer-term solution is found. I hide a key somewhere around my house, and keep emergency feeding and care instructions in my mail sorter, for the friends and family willing to help out. You can make each one of these things yourself or you can buy a pre-made ReadyKit™ from PetHub for under $25. That’s the route I went. 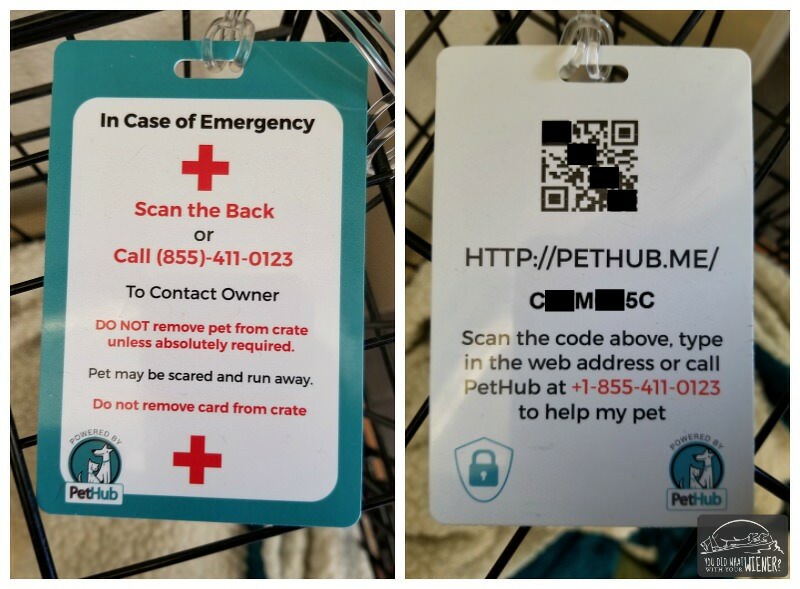 At the center of this kit is a QR Code that links to an online profile for your pet AND to a 24-hour hotline people can call to get contact info and information about your pet (that you list in your pet’s online profile). The QR code appears on 4 items that come in the kit and all link to the same online profile. It’s on the pet ID tag, the CrateCard™, the WalletCard™, and the key chain card. Even if you are home during an emergency, you should prepare by following these 4 steps to creating a successful emergency plan for your pet. One of the steps is to assemble a disaster survival kit that includes a pet-specific first aid kit, canned pet food, bottles of water, your pet’s medical records, and more. This kit is useful for you if you are home but also for friends and family that may come to your pet’s rescue in a time of need. 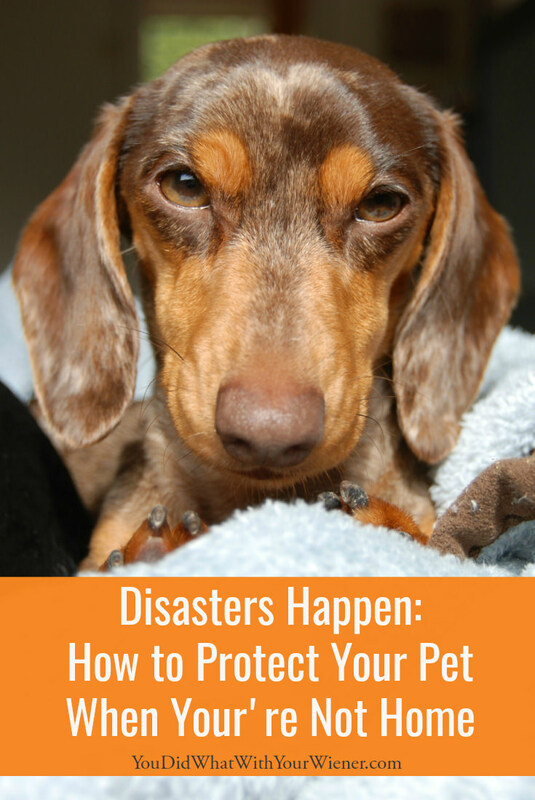 What do you do to prepare you and your pet for an emergency or disaster? Disclosure: I’ve loved PetHub from the very beginning (2010). Back then they were the only company using QR codes on PetId Tags (at least that I new of). I like them so much, I wiggled my way into a paid gig helping them manage their social media. That doesn’t influence my choice to tell you about them though. They’re just cool! I will always remember all the rescue videos following Katrina, where people had to leave their pets behind. (Because the shelters were not allowing pets of any kind). Our town always takes pets and their owners into the emergency shelter. You just have to make sure you have a crate for each pet. This was a wonderful post, hopefully more people will be prepared. I remember that too. I think that was a big catalyst for more shelters to start accepting pets. However, that doesn’t make any difference if one can’t even get home to reach their pet. I would hope that one of the first placed animal rescuers would look for pet owners is at the human shelters. Thanks for the advice, you can never be too prepared and the more information everybody involved has about our furry buddies the better. Thank you for all the tips on how to protect your pet when you aren’t home. I get worried about my dogs when I am at work all day. I think that is a great idea to put a decal on the front and back door. It would help give anyone the information they need if something goes wrong.